While January maybe a dreary month to just get through for some, there’s always something life-affirming and fresh about a whole, big, shiny new year out there to devour. Kicking off the year fragrance wise is a trio of perfumes from outre minimalist advocates, Maison Martin Margiela, whose ‘Untitled’ has to be one of the most original releases of the past couple of years. This trio of goodies is multi surprising as well as inspiring. In typical, idiosyncratic stance, Margiela’s taken scents that are universal and resonate and re-call our imagination focusing on “Flower Market”, “Funfair Evening” and “Beach Walk”. Now, I could be called a big ol’ cynic and say this could very well fall into the cliche of a relatively mass market fragrance fronting out a niche house stance but the thing is, well, they’re damned good and really gave me a sucker punch. Imagine if you will Caron’s 1930’s Fleurs de Rocaille ‘youthified’ with some added sprightly hops & skips into a 2012 Parisienne Flower Market breathing with Spring sunlight and there you have it – Margiela’s “Flower Market”. Exactly what it says on the bottle and who could argue? The tumultuous tumbling of flowers of every variety hits you high in the nose and bowls you over like a jaunty Spring lamb. Freesia, rose, tuberose and Sambac jasmine vie for attention and there’s a big dose of greenness in there, like cut stalks just plonked in water. There’s an abundance of colour and chaos and life to this fragrance that immediately uplifts. And, it’s clever. It manages to capture the imagination of the chypre obsessed classicist (ie. me) as well as, no doubt, a youthful fledgling who likes ‘pretty’. “Funfair Evening” is a late ’90s walk along a cotton-candy filled Santa Monica pier and is reminiscent of sunset strolls, laughter and the sound and colours of a Fun Fair distantly playing in the background. Both sweet and sugary, the rush may leave some crashing but for younger souls, is the food they indulge in. There’s apple, star anise and a huge marshmallow accord (caramel and orange blossom) for good measure with some bitter pettigrain to stop it being oversweet. It’s a sun filled ride on a Ferris wheel while sticky & gooey with cotton candy. It’s going to be a winner for a LOT of fans. “Beach Walk” is based upon the memory of 1970s Calvi and the memory of sun-kissed, salty skin mixed with the distinct smell of being smothered (as a child) in sun-tan oil and after-sun. Sweet ylang-ylang has a musky undertone and a big dose of coconut milk, pink pepper, bergamot and heliotrope. This is the memory for most of playing hard (as a child) during the day and taking to the beach for a stroll post dinner in some Mediterranean seaside town. Cooling sand and the dying day’s embers are recalled as well as the feeling of being somewhere strange and exciting on holiday where anything is possible. Quite like the rest of 2013, indeed. Perfumers, Jacques Cavallier and Marie Salamagne have hit the nail on the head with these and hopefully, will follow with more Replica memories. 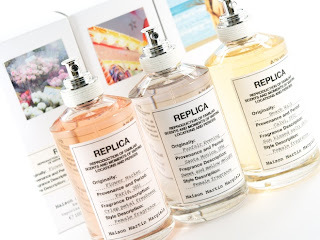 Maison Martin Margiela Replica fragrances are available exclusively from Selfridges priced at £60 for 100ml size EDT.